What more do I need to solo HAAT? My guild has not yet beaten HAAT. We have tried three times, the latest about a week or so ago and we stalled out with about 50% of Phase 4 left. I have made it a personal goal in this game to be able to solo HAAT by myself, although I'm not trying to depend on it. That said, I have a few questions about where I stand and what to do next. Those are the squads I have built so far. I can obviously solo Phase 1 with CLS with no issues (I'll insert zHan Solo to speed it up) and get through the phase at pretty much 100% strength. Phase 2 though... am I better off running Resistance with Finn lead and saving RJT for later, or am I better off with my RJT led squad? I know I'm not going to solo this phase with one squad (yet) but I need to get as much damage done before sending in my end game squad. How much of Phase 2 should be left before I send the big boys in though? I'll have AA at G12 by the end of the day, and Asaj will be there shortly (and she will get my next Zeta upgrade on her unique). So with all that in mind, can you guys take a look at my roster and let me know what you think? Have you tried using CUP? I find that I do more damage in p2 with JTR R2 BB8 ScavRey RT than what you have posted above. If you could get that fast enough with enough damage (via mods) to do 75% or so of p2 (I can auto 12M with only decent mods) and escape BB8, the AA team you have posted can finish the rest of the raid. Thanks StarSon! You can do that in Phase 2 on auto? That would be tremendous. What kind of mods and gear levels do you have on them? swgoh.gg link? Depending on RNG I get anywhere from 10-12M on full auto in p2. This guy did it with some escapes. Thanks for that! If your squad is doing 10 - 12M on full auto then mine should do a little bit better (not much, but my toons are upgraded a little more than yours). Don't gear up Ackbar any more for the raid. The best tjing, you can do, is to remove all his mods, before you send him in. You are much better off, if he dies early. Then BB8 will always call CLS to assist through Ackbars leader ability. You really want CLS to assist every time, and don't really need Ackbar for anything other than his leader ability. Your g11 Assaj is perfectly fit for hAAT as soon as she get the zeta on her unique (possibly even without the zeta). Taking Zolo out will make him available for a final rebel team should you not solo p4 as well with Ventress and her team. Wedge lead, Biggs, zolo, Leia and Ezra/Lando/whomever will be able to take the final 50%. Swap out zolo for zAsajj and you should have it. Just did this. Hopefully that image shows. Should be the difference in dmg to pull off the solo. Will Ackbar's leader ability transfer between Phases if he is dead though? I've just managed to solo P4 with JTR BB8 R2 CLS Asajj. JTR BB8 and Asajj are all only G9. Thanks guys. I feel even more confident than I did before posting this. I can't wait for the next HAAT attempt. Hey, @TVF, how did your HAAT after the nerf work out? You had mentioned you were doing one later that night on that post. I would recommend using zFinn Resistance in P2, escaping BB8. Then use RJT/BB8/R2/Thrawn/CLS in P3. That team can easily solo P3 and do at least half of P4. Who would you swap in the traditional Zinn squad for BB8? How much of Phase 2 do you think that squad can handle? In P2, you can roll zFinn, Poe, BB8, RT and RP. That team can get anywhere from 6-10 million. Just do a run where you can escape BB8. He gets a ton of chances, so it shouldn't be too difficult. Then pop him into the RJT team for P3 (which can comfortably do 20% of P2 as well). Hard to say because my results fluctuate wildly depending on how well the exposes land from Poe and the gang (new band name). I normally do around 600k-1.2m and I think I did about 750k this time. I'm assuming it cost me 100k or something but I don't know for sure. Argh I should have thought of that myself. Thanks! Would it possibly be better to sub in Scav Rey for RP though? ScavRey doesn't Expose. Better damage, yes, but no Expose. I know, but Expose doesn't do a ton of damage in HAAT (even pre-nerf) and so I'm not sure if the benefits of a fourth expose source would outweigh the loss of straight up damage or not. Not sure why people are recommending JTR for phase 3. Once your down to 20% or less in phase 2, it takes ONE team to finish the raid. Most dont require decent gear even. Why would you opt for anything else? 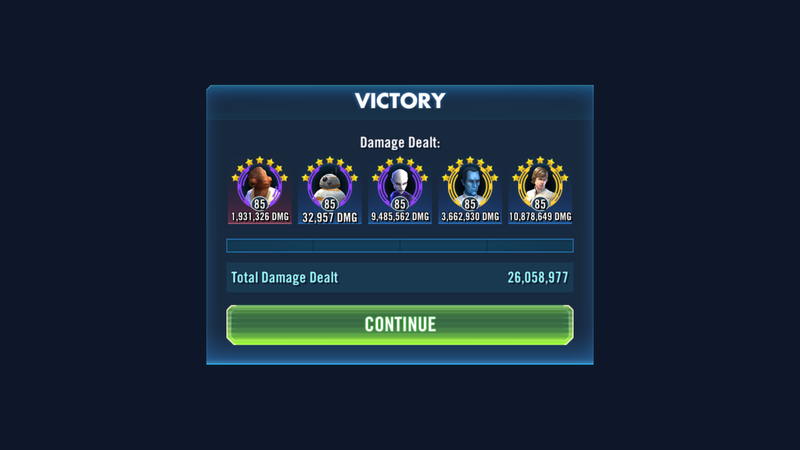 And the expose nerf had almost 0 impact on HAAT. You can still pull 35-40+% w/ zfinn/bb8. It does... but he is actually pretty easy to keep alive all the way through. Just use thrawn wisely. When I get down to the last bit of phase 4, I ignore akbar and let him die. I tried it with ScavRey tonight. Normally with RP in place of BB8 I do that 600k-1.2m I mentioned, this time I did 2.5m and got BB8 out before enrage. Thanks again! My guild is able to get HAAT down to about 50% of p3. Then I go in with RJT, CLS, resistance trooper, bb8 and R2 and finish it off. Might be a viable option for you as well. I've seen that squad in a McMole video. Seems like that squad can do even more than you are getting from it, but that is great because you are getting all you need! I'm thinking if my guild and I can get it down to 35% of Phase 2 before I unleash my AA squad we will be good. (I'm not the only one in my guild building the AA squad). My AA squad with Zolo did 21mil in regular AAT before enrage hit in Phase 4. Finished Phase 2, all of 3 and about 75% of 4. That was before I got AA to G12 and modded correctly. How will that translate to HAAT? I can not wait to find out! Asajj is better with that zeta, at least in my setup. I use JTR BB8 R2 CLS in P3 and P4. I was using Han as my fifth and it was a constant struggle to keep him alive in P3 when the canon blast goes off, even at G11. Meanwhile I just recently replaced him with Asajj at just G9 (now G10) and I don't have to worry about that. Last time out I did the last 40% of P3 and then missed soloing P4 by 0.5%. Han is (potentially) better in P3 because of his TMR, but if you can get Asajj to P4 she wrecks it with all the droid and canon deaths. There's another person in my guild that regularly posts 25-28m in HAAT using an AA Asajj combo. I don't recall the rest of the squad but I think it's a common setup, in fact it's probably that same team you're talking about. It is probably the same squad. I've seen a lot of people saying not to bother gearing AA and that they want him to die quickly. I understand that they want the assists to always be CLS or Han (who looks like he will be sitting out), but I have not seen any videos or screen shots that have a G10 or lower AA in them.